The design of the first-ever Unmanned Aerial Systems (UAS) that appeared in the late 1970s and early 1980s was determined, and limited, by the payload size and weight of the sensors available. During that time the production of high-definition aerial imagery required a platform which today is called NATO class 2 UAS1, weighing between 150 and 600 kg and requiring dedicated launch and recovery elements. Fielding such systems required an extensive amount of money, knowledge, personnel, and organizational structure, which was solely available to state actors. Additionally, those systems fell under proliferation and arms trade agreements, so the identity of producers and customers were well-known and easily monitored. But times have changed. Commercially produced, small UAS for professional business or private usage are today freely available and affordable. At the same time, the evolution in UAS miniaturization allows even the smallest systems, such as micro UAS about the size of a fingertip, to carry high value and high-performance equipment. The dangers from small Unmanned Aerial Systems (UAS) are very visible in today’s media and actively discussed in the civil and military communities. Actual threats have included quadcopters coming within meters of politicians at public events2, mid-air collisions with civil airliners, and the dropping of small explosives in current conflict areas. On the other hand, the military could benefit from the new technology, making efficient and effective use of the smaller systems for better situational awareness and a variety of other military tasks. In recent years, three major trends have been driving developments in the UAS field. Those trends are automation, swarming, and miniaturization. All three are interrelated while miniaturization of UAS components is the main enabler of the others. These trends allow industry to constantly field new UAS generations to further optimize the trade-off between flight range, maximal altitude, and most importantly, the possibility to carry a specific, or multiple, payloads. Traditional manned aircraft use mature technology for which even massive investments result in only limited capability improvements. The comparably young UAS business, on the other hand, is dealing with emerging low-cost technologies with innovation velocity much more responsive to even small investments. At the same time, the commercial UAS market is rapidly growing, promising huge revenues in relatively short term. 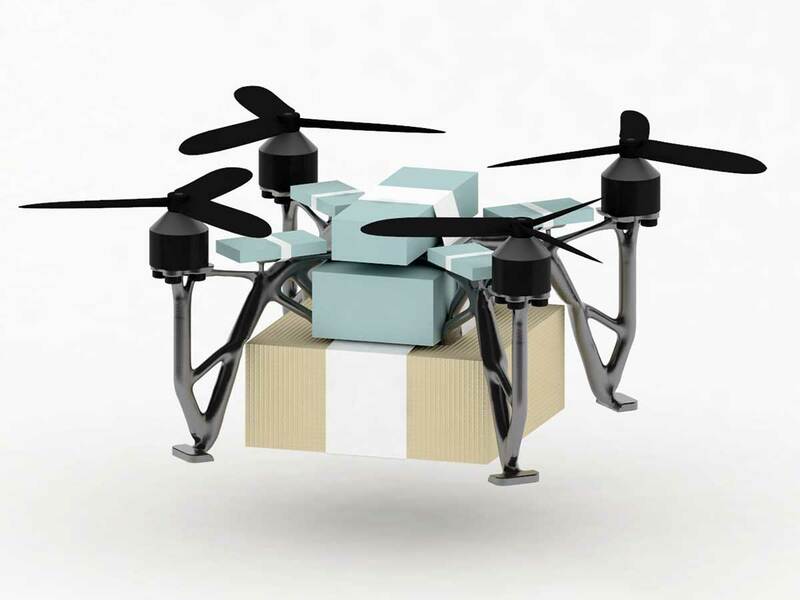 Market researchers forecasted a UAS sales volume of 11.2 billion Euros in 20203. This awarded 3D print quadcopter design6 provides an airworthy frame measuring less than 10 x 10 x 5 cm and weighting only 12 g, while still suited for payload delivery. Could such concept be copied and adapted by malign actors to print their own homemade UAS? Despite the security risk associated with the spread of increasingly smaller UAS on the consumer market, the development might be advantageous for the military as well. For example, remote-sensing service providers for farming and agricultural analysis have been using multi- and hyperspectral sensor suites for quite some time. Sensor weight and carrier system capacity required them to operate manned platforms at very high cost until the industry developed smaller, unmanned aerial platforms and smaller sensors to satisfy the customer’s need for a more cost-efficient solution. The benefit to the military is clear. Applications such as infrared, hyperspectral imaging, miniaturized for mini and micro UAS7, enable the forces to use sensors previously only available in larger systems. For example, when searching roads ahead of convoys for planted Improvised Explosive Devices (IEDs), it would now be possible to use mini or micro UAS with miniaturized, multi-sensor suites as compared to the limitations of previous UAS fitted with only one single intelligence sensor. The speed of those systems and the increased endurance using new generations of fuel cells8 should enable more robust and faster results compared to current detection and removal systems fielded as part of road clearance packages. Another example of a capability originally developed for civilian users are miniaturized, automated, navigation systems allowing UAS to perform their functions with little or no GPS signal by utilizing terrain and object recognition.9 Such signal-independent UAS navigation could benefit the military extremely well when it comes to operations in a contested environment, i.e. where the reliability of satellite navigation might be reduced due to adversary electronic warfare or cyber measures. The shrinking size of UAS platforms and possible improvements of autonomous sense-and-avoid technology may further lead to changes with regard to pilot/operator qualification requirements pending respective airspace safety regulations. This means fewer ‘certified pilots’ (same qualifications as a manned aircraft pilot) are necessary as the smaller systems, which can be employed by a ‘simple’ trained operator, will substitute the currently larger UAS still requiring a fully certified pilot. The tremendous trend of UAS miniaturization thus will create a huge amount of new and greater possibilities at lower cost. Since not only platforms and sensors but also associated components such as batteries will continue to shrink and become more efficient, even very small UAS may soon provide similar sensor performance and time-on-station capabilities as larger UAS can today. The speed of this development, however, creates the necessity to re-think the goals we want to achieve. In particular with regard to Intelligence Surveillance Reconnaissance (ISR), militaries must consider the quantity of data these systems will generate, which will require more and better educated as well as trained personnel to produce quality results, especially in near real-time processing and exploitation. Most commercial off-the-shelf (COTS) UAS can easily be adapted for military use, especially when applying non-traditional tactics and means.10 Unfortunately, the enemy has noticed the same. As demonstrated in current conflicts in Iraq, Syria and Ukraine, friendly forces may face an increased threat posed by small UAS employed by the enemy with unforeseen tactics, techniques, and procedures. Additionally, further developments in additive manufacturing (also known as 3D printing) may allow and encourage the production of homemade UAS, whose threat potential will be very difficult to predict. Relatively slow government procurement processes make it hard for the military to keep up with the current speed of those innovations as typical for the ‘information technology cycle’, relying on intuition as well as trial and error rather than perfect testing and safety considerations. While Counter-UAS (C-UAS) capabilities are increasingly the focus of research, testing and fielding, the continuing trend of UAS miniaturization remains the greatest challenge for the developers largely due to detection and engagement difficulties. While the ever decreasing size of UAS is an important factor for detection, it is however not the only parameter to consider. Target identification is an issue for many defence systems as well. For example, it can be extremely problematic for a radar sensor to differentiate between a small UAS and a swaying tree or other natural phenomena, especially when occurring in large numbers such as a swarm of birds or insects. Sophisticated UAS may even be capable of simulating the shape and movement of such creatures. This may not shield them from eventual detection; however, it complicates their categorization as an adverse object, which remains the most important step. Apart from the object’s affiliation there is a following challenge to determine its likely intent. Uncertainty whether one or more small UAS detected around a force will simply be used for intelligence collection, to deliver non-kinetic effects, carry lethal payloads or even function as so-called ‘kamikaze drones’11 trying to cause secondary explosions by serving as the trigger detonator12, underlines the importance of permanent nearby airspace surveillance and flexible C-UAS response options. Given recent developments in light nano-explosive designs, which are able to create effects at least two times more powerful than heavier conventional explosives13, friendly forces will have to dedicate additional resources to protect against this increased threat. Currently fielded C-UAS systems can only provide effective surveillance and effective cover of a relatively small area around their employment location. Furthermore, engaging small-sized UAS with regular air defence weaponry will probably show little success. Given the advance in UAS miniaturization (including weapon payloads) and UAS swarming, NATO needs a comprehensive approach for dealing with these trends and subsequent threats. Recent years have shown that technological advancements and trends towards miniaturization of UAS are unlikely to stop. The associated chances and risks articulated in this article will continue to evolve. A clear understanding of those chances will enable users to leverage UAS advantages to the benefit of the Alliance and its partners. With regard to threats, however, the Alliance must recognize that neither stopping proliferation nor restricting the use of miniaturized UAS will be feasible. Consequently, UAS miniaturization will lead to a broader range of potential users, to include malign actors, which create threats that will not only have to be addressed by armed forces but, increasingly, by law enforcement agencies as well. Therefore, a comprehensive approach which encompasses a universal understanding of the threat, as well as the ways and means to counter it, should be embraced by the civil-military security community. In this regard, the JAPCC is currently participating in a C-UAS study run by the NATO Science & Technology Organization. This study includes military as well as civilian stakeholders. In the days ahead, equipping friendly forces with effective and innovative C-UAS capabilities will be of utmost importance. A mere reactive approach will not be sufficient. Further C-UAS system development should encapsulate multiple sensors and effectors to make sure the entire spectrum of detection and engagement is available. This spectrum should include not only fencing, jamming, and kinetic engagement to destroy systems immediately threatening friendly personnel and assets on the ground. It should also encompass UAS communication tracking, since the ultimate goal will most likely be to identify the individual employing/using the miniaturized technology. Some of the C-UAS technology currently available or under development will be described in the following essay in this Journal edition. 1. NATO UAS Classification Table: AJP- 3.3 Ed.B V1. Allied Joint Doctrine for Air and Space Operations p. 71. 5. Hammes, X.T., Technologies Converge and Power Diffuses. The Evolution of Small, Smart and Cheap Weapons; in: Policy Analysis No. 786, CATO Institute, Washington, DC, 2016. 7. Hinnrichs, M., Hinnrichs, B., & McCutchen, E., Infrared hyperspectral imaging miniaturized for UAV applications. Infrared Technology and Applications XLIII. Anaheim, California, USA, 2017. doi:10.1117/12.2262125. 9. Piermattei, L., Bozzi, C. A., Mancini, A., Tassetti, A. N., Karel, W., & Pfeifer, N., Multispectral data processing from unmanned aerial vehicles: application in precision agriculture using different sensors and platforms. 19th EGU General Assembly, (p. 13944). Vienna, 2017. 10. Ewers, E. C., Fish, L., & Horowitz, M. C., Drone Proliferation. Policy Choices for the Trump Administration: Center for a New American Security Washington, DC 2017.
commissioned to the German Army as an artillery officer in July 2003. His subject matter expertise comprises Unmanned Aerial Vehicles (UAV) and Imagery Intelligence (IMINT). In previous assignments he was deputy commander of a Tactical UAV (LUNA) company and Instructor for NATO Aerial Imagery Target Categories and Head of the Full Motion Video Section at the German IMINT Training Centre. Major Busch holds a university diploma degree in Social and Political Sciences from the Bundes-wehr Universität München and a Master of Business Administration from the University of Applied Sciences in Kempten.